I felt quietly confident about Arsenal going into this match. Arsenal are a very good home team and Unai Emery has been able to game plan well for these big matches this season. Arsenal then went out and played an excellent first half, sat back a bit in the second half but still created their two best chances of the night and were unlucky to not add a third goal. A two goal lead puts Arsenal in a great position to advance to the semi-finals but they still have a dreaded away match next week after a match at Watford on Monday Night Football (thanks Premier League TV partners). 122 – Final third passes completed, more than a third of their completed passes were in the attacking third of the field. 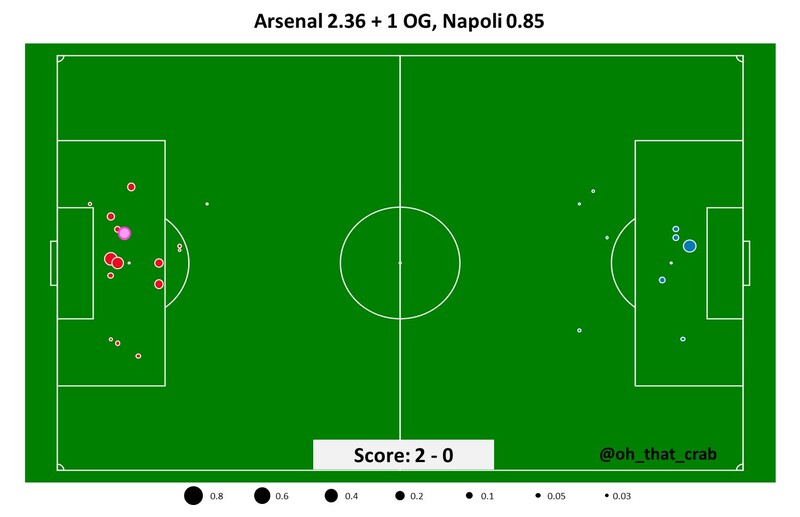 Napoli had just 19% of their’s in Arsenal’s defensive third. 13 – Tackles for Arsenal, led by Sead Kolasinac. 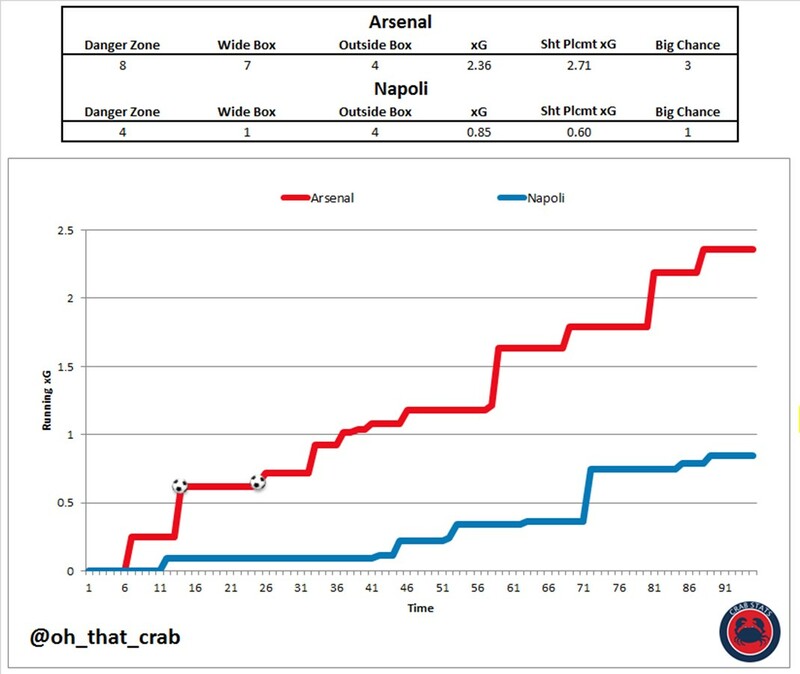 Even more impressive Arsenal were only dribbled past 4 times in this match and had a tackle success rate of 76%. 18 – Interceptions for Arsenal, led by the ageless wonder Laurent Koscielny. 84% – The odds that my simulation model gives Arsenal to advance to the semi finals. FiveThirtyEight has Arsenal at 87% to advance. Overall this was a very impressive performance from Arsenal. 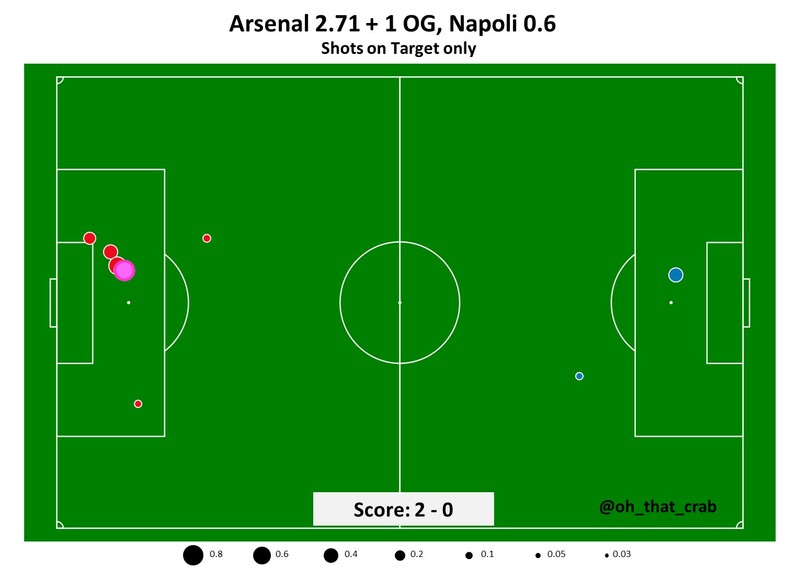 Napoli haven’t played well away this season but Arsenal still did a really good job pressuring them early and then in the second half disrupting their attempts into the final third while still providing attacking threat. This isn’t the most impressive statistical line from the Arsenal captain but I think that it also illustrates how hard it is to measure the impact of a defender. When he is in the lineup things just work better. I thought that in this match, and really for most of the season Koscielny has been Arsenal’s best defender. At his age that would be an impressive feat for player, considering that he is coming off an Achilles injury that can end careers it is even more impressive. It is a bit sad that it took this long for Unai Emery to figure out that Aaron Ramsey’s best position in the team is starting as a central midfielder with license to go forward. He doesn’t have quite the same offensive freedom that he had under Arsene Wenger, where at times he’d abandon midfield completely and turn into a forward. Finding a like for like replacement for Ramsey is going to be impossible. There just aren’t other midfielders that can match his ability to run forever pressing, his ability to defend when needed, his ability (and audacity to even try) to flick/one touch pass around the box, his ability to create for team mates and most importantly his ability to get shots in the danger zone from open play. When I say impossible, I am really not using hyperbole. I have looked through my database of player statistics and his profile as a player is incredibly unique. There are players that are his equal or better at certain areas but the way that he combines them is unique to him. He isn’t a irreplaceable but who ever comes in won’t do things the same way and will have big shoes to fill. I really hope he can help lead Arsenal to a European trophy on his way out of the club. Good result, and I’m kinda confident that we can at least get a goal away from home. Ramsey will be really missed when he’s gone. I know he’s divided opinion over the years, but when he’s fit and got a few games under his belt he really is superb. And maybe some truth in the suggestion that with Emery around he’s getting the kind of tactical guidance he needed to develop. Lucas Torreira a top guy too, shows what we’ve been missing in the league. Small but beefy, normally comes back with a vengeance… did anyone else know his hometown is Fray Bentos? True story. Can you add who from your database is comparable? Also tell us if you have candidates for the wing and defense. What about James Rodriguez? Especially for Colombia, where he is allowed more freedom, rather than his club sides, where he is playing with (other) superstars. That’s what happens when Ramsey plays a disciplined game, and his runs into the box start from deeper instead of just being upfront already. Tactically he is still bad at reading the game and adjusting to fit into what is happening but now that he is given a role that has taken away his need to guess about his positioning, he is flourishing. I think this might be his best sequence of performances, even better than 13/14, because in this second half of the season, he is playing a more complete game and balanced game. He will thrive at Juventus and looks a ready made replacement for Matuidi. That is the first player who came to mind when Ramsey is said to be unique, I don’t think the playing style is really reflected through stats because the teams are different. However, having said all that, I don’t think Arsenal has ever really been consistently at its best as a team when Ramsey or Wilshere have been in midfield. Their presence, even if they are playing well, seems to benefit them more than it does the entire team. We have the quality to win the Europa, but building around Ramsey has already failed and a replacement should be different from him. I always thought we needed a more controlling central midfielder to complement or come in for Xhaka and Torreira as a rotation option. If Ramsey wants to go out with a bang, I say he is capable of taking us all the way there and finally having a trophy that can be attributed to his performances, rather than the FA Cups, where all he did was score winning goals in the finals, doing very little to get us to those very finals. I would probably vote for Kos being our POTY. What he managed to do this season is absolutely unbelievable. He may not by truly our best player this season, there will be a legit discussion around it, but I would vote for him. Love him and I am very impressed. My captain ! The moment he came back, you just saw the difference in quality from the players who played before him. He is one of the best defenders on the planet, and if it wasn’t for his injury issues, he would be making a case for being the best. Many people make a noise about being big, but Kos, Ramos and Thiago Silva are not that big, but individually, they might just be the best 3 centerbacks on the planet. I guess the team’s style of play and way of defending can help a defender stand out, like Van Dijk, but Kos can stand out anywhere and under any playing style. *What ABOUT a special podcast, sorry. I have found a defense of papa and kos, occasionally including Monreal, to be very effective and sound. Absolutely agree Pico. In a season where there’s no obvious standout individual performances, I would put in my vote for Kos as well. The level of his performances not to mention his aura on the team considering he ruptured his ACL only less than a year ago has been truly inspirational for all. In my eyes, Kos is the true World cup winner (not some bloke named Advil Rami who wears the medal around his neck). Does the +1 OG in xG mean that our actual goals were 1 against expected output of 2.36? This is the best I’ve seen Ramsey since his 2013 season. When he’s on fire like this he’s irreplaceable, only comparable with Frank Lampard, better in fact, however, his inconsistency isn’t on the same level, be it injuries, tactics or form etc. One things certain though, him going for free is truly a monstrous decision, whoever has made it. Explanations really are needed. Always said Ramsey would thrive in a midfield 3, where he could influence the game from deep but also have license to roam further forward. A shame it’s not a formation Wenger or Emery have persisted with here but the fact that he’s also thriving in at 10 and in midfield two just goes to show his versatility. Potentially a fantastic bit of business from Juve, considering what they’re saving in transfer fees. With respect, your database of player statistics amounts to the square root of f*ck all.